Just a reference book, right? 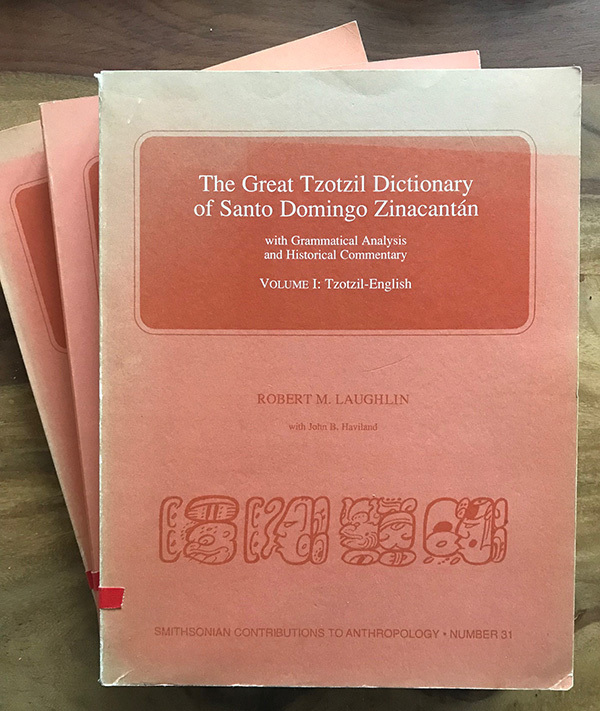 R ecently I bought a copy of The Great Tzotzil Dictionary of San Lorenzo Zinacantán by Robert Laughlin and I did not expect it to become a historical detective story. I’m interested in this language for several reasons, I visited the Chiapas region of Mexico as a teen and I’ve returned several times. The Dictionary arrived, all three volumes, over a thousand pages and I was content to add this to my language collection. Tzotzil is a language I’d like to learn once I have moved further along with my current projects. My plan was to put the books on a shelf and start using it as a reference book at a later time. But this is much more than a large and heavy dictionary and it started when I discovered that it was a signed edition with an inscription. Who was Ulrich? Why was he a “fellow riddler”? And what was the riddle? A dictionary is not merely a list of words, but a creation of its time influenced by those who prepare for its coming, and by those who touch it. Not merely a passive creation, it influences the lives of those who touch it … Those who expect to follow an unequivocal history will be caught, as was I, in a web of mysteries. Laughlin sets about to recreate the times and the individuals who most likely contributed to the creation and preservation of this work. Among them, He writes about an anonymous Z who was an early contributor to El diccionario grande, the source of The Great Tzotzil Dictionary. Who was mysterious Z? What was the chain of ownership? These pages raised more questions. But I’m getting ahead of myself. A digression on Tzotzil is necessary – Tzotzil (or Bats’i k’o in the native language) uses the Latin script acquired through the contact with Spanish missionaries and it doesn’t have a unique historical script or syllabary. As far as I know it did not have a written form prior to the missionary effort of trying to catalogue the language. I may be wrong, and if you do know of a written system for the language leave me a note! 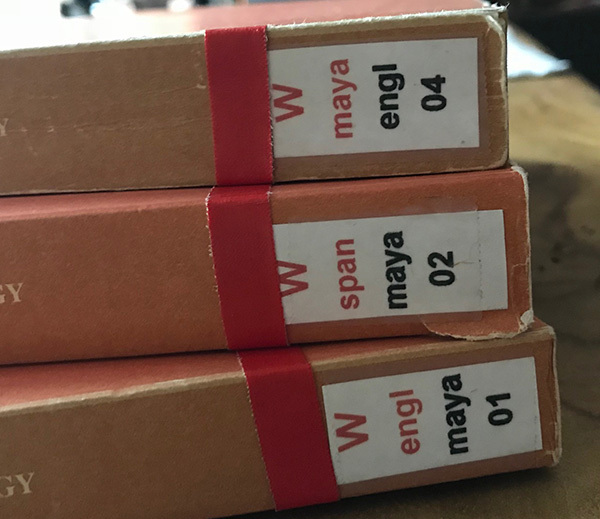 A little language background from my research – Tzotzil is a Maya language spoken in the Mexican state of Chiapas. Today, in Central Chiapas, some primary schools and a secondary school are taught in Tzotzil. The size of the language community is about 200,000 to 250,000 speakers with a third of them only speaking Tzotzil. As languages do, they evolve and splinter – Tzotzil has six primary dialects with varying degrees of mutual intelligibility, named after the different regions of Chiapas where they are spoken: Chamula, Zinacantán, San Andrés Larráinzar, Huixtán, Chenalhó, and Venustiano Carranza. Tzotzil, Tzeltal (most closely related language to Tzotzil, together they form the Tzeltalan sub-branch of the Mayan language family) and Ch’ol are the most widely spoken languages in Chiapas. Here is another mystery – Laughlin wrote that in comparing old written records on the language he was able to read and understand these sources easily and saw little variation or evolution. He asks a question that some linguistic researcher may be interested in answering, from his observation of Tzotzil it may be that the pronunciation of written languages evolves faster than orally transmitted languages. It’s a curious thought. Is he right? Do writing systems increase the rate of evolution of spoken language? Was that the riddle? Back to Ulrich and the great chain of ownership. How did Laughlin acquire the original El diccionario grande and how did I end up with Ulrich’s copy of Laughlin’s work? This last part of the mystery was easy to solve. Several hints where there – “FB Geo/Völk” was stamped on the edge of books, there is a library classification on the lower book spines (and why don’t they match? ), and that personal note from Laughlin. An Internet search of led to the discovery of a review by an “Ulrich Köhler” in an old journal of Linguistics. Aha, maybe I had my Ulrich? A further name search led to a German film director and a German archaeologist (but who died before Laughlin published his book) and finally a Professor Ulrich Köhler at the Institut für Ethnologie at the University of Freiburg. He had been director of the “Instituts für Völkerkunde” up until 2002 (this matched the side stamps) and well before had written a dissertation on cultural change in Chiapas (Mexico). I had the right person. Unfortunately he passed away in 2016 (the university has a memorial page that cites his work, research interest and passion for Chiapas) and this explains perhaps how these books found their way to a book seller and, finally, to me. 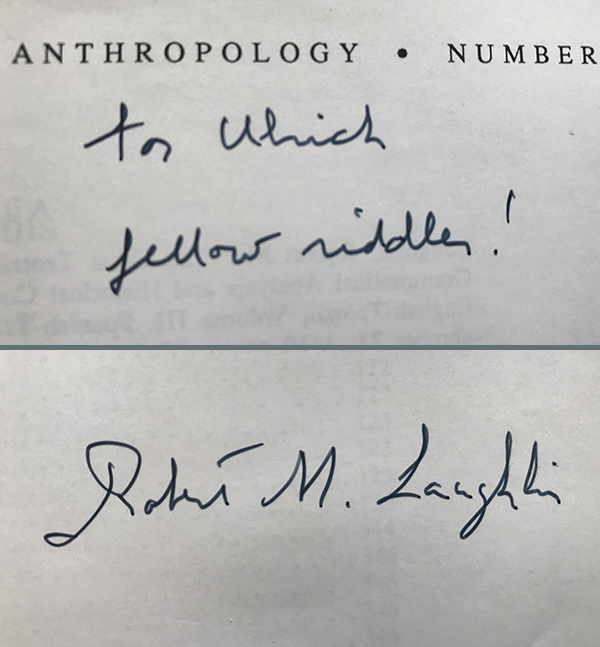 The “fellow riddler” was an ethnologist, perhaps with interests as a linguist or a language learner. 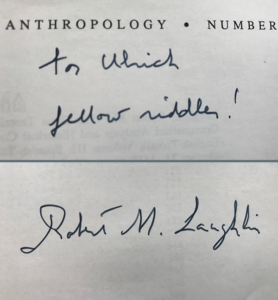 So we now know the recent provenance of the Laughlin’s book: Laughlin -> Köhler -> Me. Very nice ! Thanks for the note, I’ve also collected quite a list of resources. You can find them over at http://forum.language-learners.org.